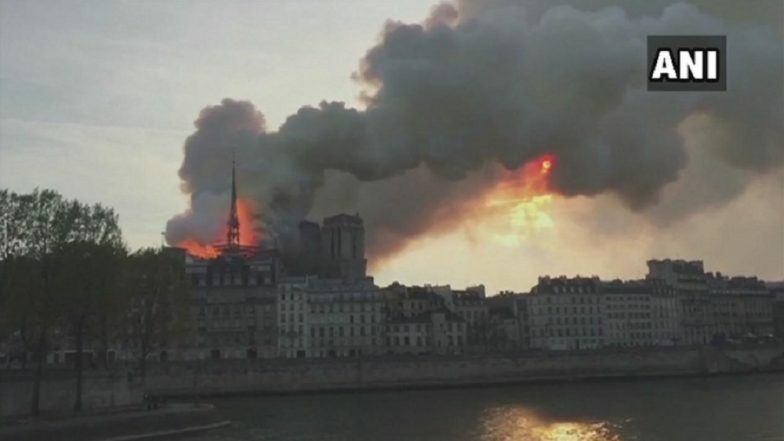 Paris, April 15: A huge fire swept through the roof of the famed Notre-Dame Cathedral in central Paris on Monday evening, sending flames and huge clouds of grey smoke billowing into the sky. The flames and smoke plumed from the spire and roof of the gothic cathedral, visited by millions of people a year. A spokesman for the cathedral told AFP that the wooden structure supporting the roof was being gutted by the blaze. The fire service said the blaze could be "potentially linked" to ongoing renovations. President Emmanuel Macron cancelled a major televised policy speech he was due to give on Monday evening over the "terrible fire ravaging Notre-Dame." Paris mayor Anne Hidalgo in a tweet described it as a "terrible fire". Philippines: 27 Killed as Terrorists Target Cathedral in Jolo Island. Fire trucks could be seen speeding through Paris towards the scene on the Ile de la Cite -- an island in the Seine at the heart of Paris. The Paris police department in a tweet called on residents to avoid the area and to "make way for rescue vehicles". US President Donald Trump in a tweet said: "So horrible to watch the massive fire at Notre Dame Cathedral in Paris. Perhaps flying water tankers could be used to put it out. Must act quickly!" Hundreds of people gathered on the bridges of Paris downriver to witness the scene, some filming the images with their smartphones, an AFP reporter said. A burning smell filled the air.